New CSO figures show there were 17,958 births in the second quarter, with the average mother aged 31.9. 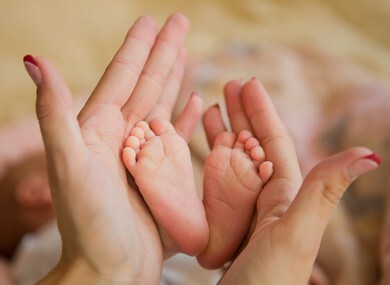 IRELAND’S BIRTH RATE fell by 2.3 per cent in the second quarter of 2012, when compared with the second quarter of 2011. Figures released by the Central Statistics Office show that 17,958 babies born in Ireland between April and June of 2012, down from 18,381 in the same period of last year. Three-eights of births were to first time mothers, while 36 per cent of births were to second-time mothers. The average age of mothers in the second quarter of 2012 was 31.9 years, up slightly from 31.8 in the equivalent period of 2011. There were 6,164 births (34.3 per cent) registered to parents outside of marriage or civil partnership, up by 1.6 per cent on last year; the highest percentage of births outside marriage or civil partnership was in Limerick City, at 58 per cent. There were 7,080 deaths registered between April and June, down by 2.7 per cent on the same period of last year. For the second quarter in succession, the CSO figures do not indicate any maternal deaths as a result of complications from pregnancy or childbirth. Meanwhile, there were 5,421 marriages registered during the quarter, and 120 civil partnerships. The CSO now estimates the Irish population, as of the end of April, to be 4,585,400. Email “Birth rate down by 2.3 per cent in second quarter of 2012”. Feedback on “Birth rate down by 2.3 per cent in second quarter of 2012”.